I love decorating with vintage glass, don’t you? 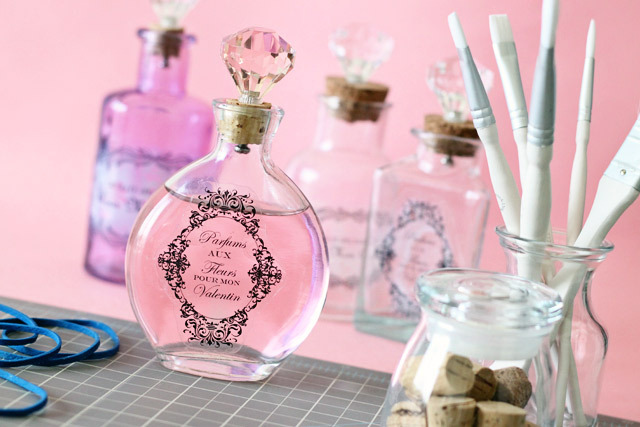 Just the other day, I was browsing the aisles of my favorite home store, eyeing some gorgeously girly apothecary bottles. I loved the idea of gifting them to my favorite girlfriends as a little treat on Valentine’s Day, but I did not love their price tag. Yikes! Thankfully, my shopping trip that day also took me through the aisles of a home and hardware store, where I spotted some sparkly glass drawer pulls. They were identical to the adornment on the bottle stoppers of those apothecary bottles. I knew I could pull off apothecary bottles as a DIY project. First, unscrew the screw base from your drawer knob. Then, using your screwdriver, drive the screw through the bottom of your bottle’s cork. 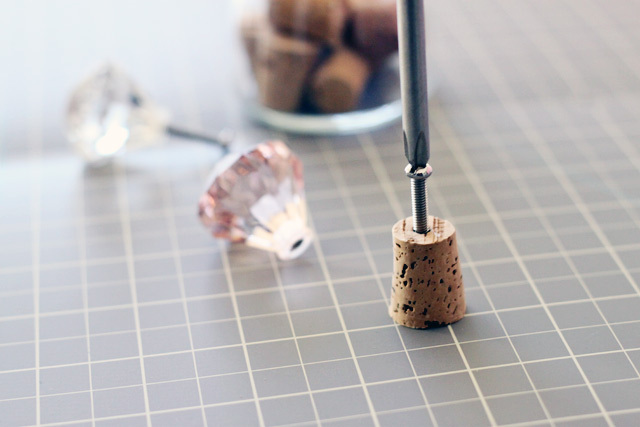 If you find it’s tough to do, try using a power drill to pre-drill a hole in the cork. Drive the screw through until it pierces out of the top of the cork. Then, re-attach the knob part of your drawer pull. If your screw is longer than your cork, let it extend out from the bottom. 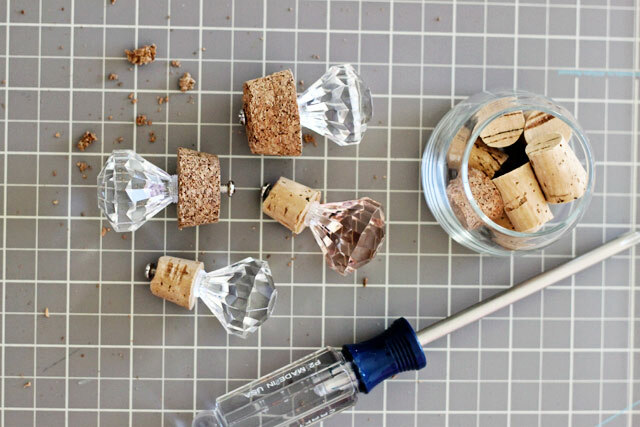 If it’s too short, use a saw or craft knife to cut your cork down a bit. 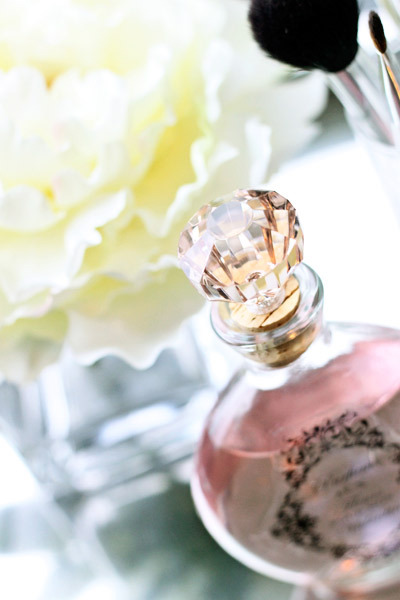 Next, you’ll want to adorn your bottle with some kind of design. 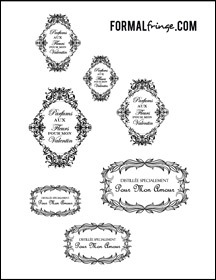 You can try designing your own or searching online for vintage label designs. Or, use this one I created for you. This printable features two different Valentine-themed labels, one vertical and one horizontal, in a few different sizes. Once you find the label you like and the size that fits your bottle, you’ll need to print it out onto a clear background. I used printable acetate sheets. You can find them in most office stores. Cut out your label, trying to stay as close to the design as possible. Make your cut-out uniform and neat. Next, apply a very thin layer of glue to the back of the label and lay it in place on the front of your bottle. Fasten the label into place with rubber bands, if you need, and leave the bottle out to dry. Since acetate isn’t very breathable, this label will need to sit for at least a day to dry. Leave the bottle (or bottles, if that’s the case) in a cool, dry place overnight. It’ll be ready when the glue dries to become completely clear. 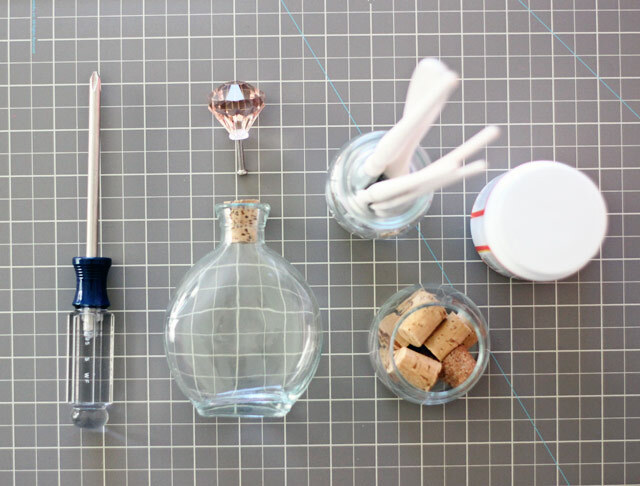 With the glue dried and the drawer pull cork stopper in place, these DIY apothecary bottles look as good as the ones you see (and drool over, if you’re me) in home decor stores. 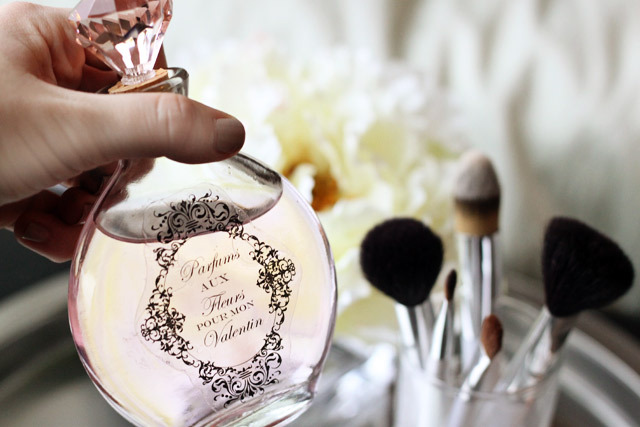 They’re the perfect girly touch to a vanity table or boudoir. I filled mine up with water tinted with just a tiny drop of pink food coloring. It looks femme and luxe and I can’t wait to give the others away! This is such a lovely idea, and you put it together perfectly! I’m constantly amazed by the way it seems possible to DIY just about anything anymore. I’ll definitely be trying these sometime! Aww, thanks! I’m amazed by so many DIY projects out there–people can be really clever! You’re welcome! Thanks so much for checking out the site! I love these! Where did you ever find the bottles? Wish I could pop out a good idea like this! I found the bottles at my local Michael’s craft store. You could probably find them at Hobby Lobby or a similar place, I think. Brilliant!! You are always so clear in your instructions!! Gotta try ’em. This is beautiful! Do you need to seal the front of the label so the ink does not smear or is this negated by using acetate? I sealed the front of the label, but I don’t think it’s necessary. If you use print-on acetate, the ink stays on really well. These are absolutely befuaitul. I’ve been collecting hand-thrown mugs for years, and I’ve never seen such a befuaitul, delicate design as this one. Wow, well done! Gorgeous bottles!I Love the feminine touch.The older I get the more I like it,and I hope my grand daughter will catch the bug too!As if she doesn’t already have her own tiara..Thank You for sharing. Just came back to add to your idea.I think these labels could also be printed onto “sticker paper”which you can find in most Walmart stores or office supply stores.Waterslide stickers could be another useful idea…LoL,I just love your inspiring DIY projects!!! ABSOLUTELY AWESOME…THEY ARE SOOOO FABULOUS. I’M LOOKING FORWARD TO THIS PROJECT. I WILL BE MAKING THEM AS A GIFT TO GIVE ALL MY FEMALE FRIENDS ATTENDING MY 50TH BIRTHDAY CELEBRATION. I’ve tried this and was very happy with it. My problem was the cork did not fit back in the bottle. Is there a way to shaved the cork smaller? 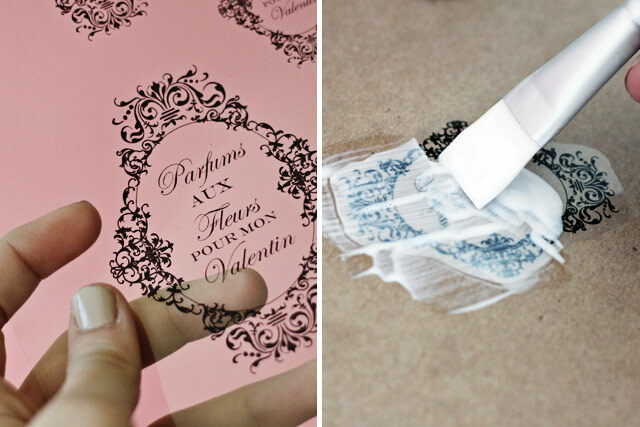 You can also use the wet sticky tape technique on the labels too. It’s on YouTube.